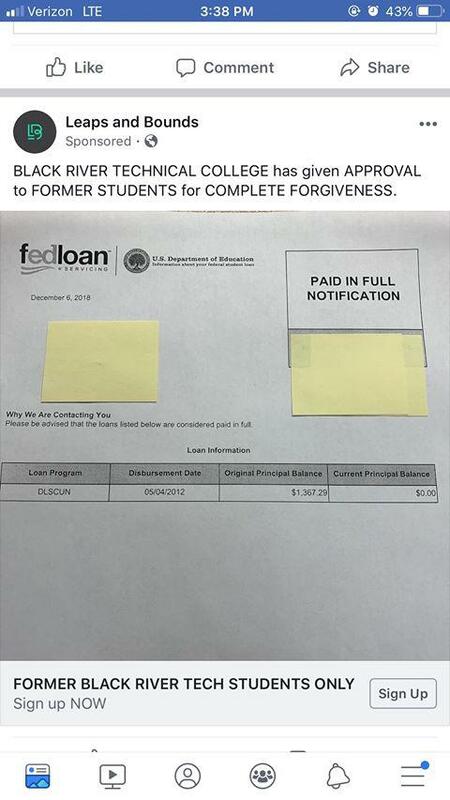 Black River Technical College officials are warning students and alumni of a student loan forgiveness ad on social media they are calling a scam. Officials sent a photo to KASU News on Monday of the Facebook ad from Leaps and Bounds. The ad reads "BLACK RIVER TECHNICAL COLLEGE has given APPROVAL to FORMER STUDENTS for COMPLETE FORGIVENESS." The ad also has a picture of a "paid in full" notification letter. BRTC says the ads are targeting students and alumni and are a scam. Officials say anyone with questions about school loans or loan forgiveness can contact either Drew Garland, the Default Prevention Specialist at BRTC, at 870-248-4022, or the BRTC Financial Aid office at 870-248-4017.